From Latin gladius (“Roman short sword, gladius”). Doublet of glaive. (historical) A Roman sword roughly two feet long. Finally, the Romans made the gladius—sharp, of highly-tempered steel, and strongly piercing—the first real sword (Figs. 17, 18, 19), of which only five specimens are now known to exist. 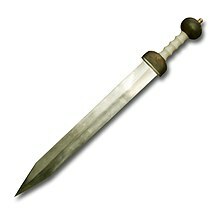 The gladius was effective either for cutting or for thrusting and was used by legionaries and auxiliaries. (zoology) A pen, a hard internal bodypart of certain cephalopods, made of chitin-like material. From the Cretaceous of North America fossilised gladii in the enigmatic genus Tusoteuthis have been estimated to give a mantle length (body size) of 1.8m, just less than that of the giant squid’s. From Latin gladius (“Roman short sword, gladius”). Like many Dutch words borrowed from Latin, the plural takes the form of the Latin nominative plural. Possibly from Gaulish *kladyos (“sword”) (compare Old Irish claideb (“sword”), from Proto-Celtic *kladiwos (“sword”), from Proto-Indo-European *kelh₂- (“to beat, break”). Cognate with Latin clādes, clāva, percellō. Put the sword into its sheath. To fall on one's sword.